Healthy detoxification is reliant upon healthy liver, kidney, bowel, digestive, lung, lymphatic and immune functions. Your body is a detoxification system and carries out this job 24 hours 7 days a week. The success of this process is determined by 3 key factors – the amount of nutrients available to process waste, the way the genetics control the ability of body systems to work, and the level of toxin load coming in. Heavy metal toxicity, chemical toxicity, vitamin and mineral deficiencies, genetic factors or imbalances in the mineral ratios within the body can significantly impair the function of the detoxification organ systems. A healthy liver is required for a healthy bowel and good digestion. The better the liver works, the healthier the gut is, and the less stress there will be on the kidneys, immune system and lymphatic system. The symptoms of a dysfunctional liver are outlined below. Abnormalities in the level of fats in the blood stream e.g. 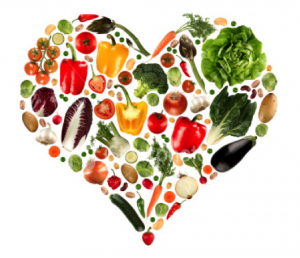 elevated LDL cholesterol and reduced HDL cholesterol and elevated triglycerides. Arteries blocked with fat, leading to high blood pressure, heart attacks and strokes. Fatty liver and build up of fat in other body organs. Allergies- sinus, hay fever, asthma, dermatitis, hives, etc. What Does Your Liver Actually Do? Detoxification of heavy metals and potentially toxic chemicals that originate from both inside and outside of the body including drugs, alcohol and toxins from intestinal worms, bacteria and yeasts. This is accomplished with antioxidant nutrients and enzymes such as glutathione reductase. The liver detoxifies harmful substances by a complex series of chemical reactions which are broken down into two compartments – phase 1 and phase 2. The role of the various enzymes in the liver is to convert toxins into water soluble substances or fat soluble substances that can be excreted in the urine or the bile depending on the particular characteristics of the end product. Storage of sugar as ‘glycogen’ and the conversion of glycogen to glucose when blood sugar levels drop. The liver is vital to the regulation of blood sugar levels. Production and storage of proteins as well as the regulation of many substances involved in protein metabolism. This affects hormonal and brain chemistry because protein is required to build hormones and brain chemicals. It is also required for body repair and the immune function. Production of bile which is essential for the digestion of fats and protein. Production of blood proteins, clotting factors and substances important to the production of red blood cells. Regulation and detoxification of a number of hormones. Neutralization of ‘free-radicals’ by antioxidants. Free radicals are highly reactive oxygen molecules that can damage tissues and the DNA structures within cells. Storage of vitamins and minerals, mainly iron, copper, B12, vitamins A, D, E and K.
The liver plays an important role in digestion because it produces bile which is essential for digestion in the small bowel. Bile is also required to help the gut muscle to move and so prevent constipation. The liver is involved with assimilation (building up body tissues). Red blood cells, which are responsible for carrying oxygen around the body, are recycled in the liver. Many factors determine whether the liver performs its functions well. Too much pressure on the liver from overeating rich or poor-quality food, exposure to chemicals, metals, alcohol, smoking and drug use or frequent emotional stress can cause liver overload. Chemicals, alcohols, caffeine, drugs, medications and the toxins produced by various types of infections can all cause phase 1 to become overactive. An overactive phase 1 will often lead to stress within phase 2, which is where most people’s liver stress originates. Heavy metals can compete with minerals for positions in all liver enzyme systems and nutritional deficiencies can result in the liver pathways not operating at the right rate. All of these factors can lead to a decreased ability to clear toxins, metals and hormones and impair the manufacture of bile which is essential for waste clearance and detoxification. The symptoms of a sluggish or overtaxed liver are varied and can include any combination of the above symptoms. The symptoms are likely to manifest in the weakest parts of your body and can vary widely from person to person. Your liver is one of your most important organs of detoxification and continuously processes many different substances from your digestive tract and the rest of your body throughout the day. It has to deal with numerous compounds, some of which are very toxic and others which are beneficial, and to decide what to do with them. Your liver is very good at deciding what needs to be kept and what needs to be removed. It functions like a massive chemical plant that manufactures certain compounds, detoxifies dangerous compounds, and directs substances all over the body for use, storage or excretion. Your liver makes use of two pathways in order to carry out its detoxification work. These are called the phase 1 and phase 2 pathways. You could think of phase 1 as being the preparation department, and phase 2 as the packaging department. These are the routes by which things get to leave the liver and eventually, the body. Phase 1 in the liver is the first stage of detoxification. You could think of the byproducts from phase 1 as many freshly laid and fragile eggs from different birds that are churned out every second in the phase 1 factory. These eggs need to be quickly organised and sent down the correct phase 2 conveyor belt before they back-up and create a huge mess. Chicken eggs must go down the chicken egg conveyor belt, and geese eggs down the geese egg conveyor belt. The eggs are swiftly organised on to specific phase 2 conveyor belts where workers (phase 2 enzymes) add certain “special substances” to create boxes and bubble wrap (taurine, glycine,sulphate, glutathione and methyl) which stabilise the eggs and make them ready for transport out of the body. You could think of the phase 2 pathways as being conveyor belts in constant motion extending outwards from a central point. This is where the phase 1 pathway empties its byproducts. Each phase 2 conveyor belt adds specific substances to those byproducts, enabling the toxins to be passed either through the kidneys (urine) or the bowel (bile) and removed from the body safely. If one of the phase 2 conveyor belts is not working well, the liver will try to shunt toxins down another one, but this is not always possible. There are times when the process goes wrong. In Multiple Chemical Sensitivity (MCS) for example, phase one has gone into overdrive and the phase 1 birds are making way to many eggs, while the phase 2 workers are overwhelmed and can’t keep up with the packing. This creates a bottle-neck at the beginning of the phase 2 conveyor belt and the eggs spill over, making a mess. The toxic metabolites that are bottle-necked at the beginning of phase 2 start to circulate in the blood stream and can cause damage throughout the body. People who are chemical sensitive need help to slow down their phase 1 pathways and to increase their phase 2. They need to be careful not to use supplements that stimulate phase 1 while trying to address the phase 2 issues. These people are sometimes referred to as “Pathological Detoxifiers” and can be identified as those individuals who are highly sensitive to fumes – petrol, solvents, paints and perfumes, react adversely to various pharmaceutical drugs or supplements and may have a reaction to drinking caffeine or alcohol. They may also feel ill when going through the cleaning isle in the supermarket or are in the presence of a person wearing perfume (for example). Phase 1 can become easily over-stimulated by chemicals, caffeine, alcohol and other types of toxic compounds. Phase 2 enzymes can struggle to meet the increase of phase 1 activity especially when the proteins, vitamins and minerals they rely on are not available in abundance. Heavy metals in particular can make the phase 2 enzymes dysfunctional by occupying sites within the enzyme that beneficial minerals should be filling. Phase 1’s speed of metabolism can also affected by things like genetics, exercise and the presence or absence of certain foods, other substances, drugs or supplements that either speed it up or slow it down. Phase 2 MUST be working well enough to keep up with phase 1. The efficiency of liver enzymes decreases as we age. Aging also tends to decrease blood flow through the liver, further aggravating the problem. A lack of the physical activity necessary for good circulation, combined with poor nutrition adds up to a significant impairment of detoxification capacity. This is common in aging individuals where mobility and independence are compromised. This partially explains why toxic reactions to drugs are seen so commonly in the elderly. 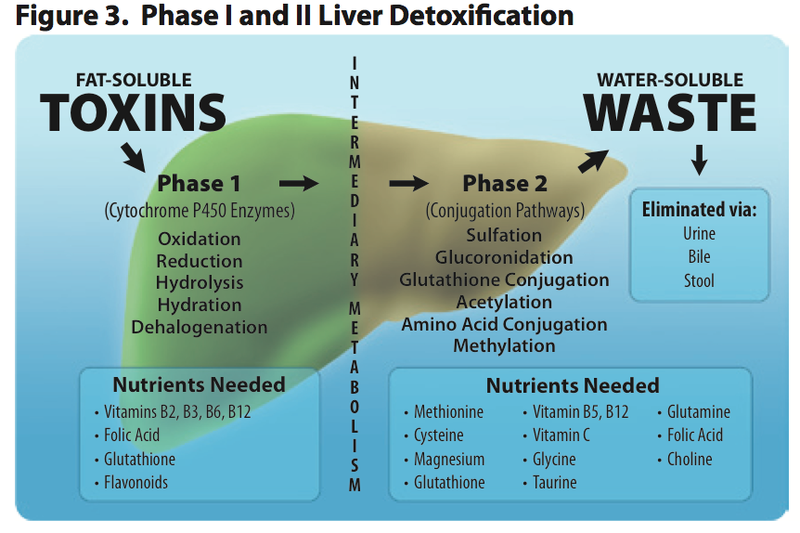 The metabolites from the phase 1 detoxification process are often potentially more harmful than their original toxic compounds and can damage the liver cells. It is important for health that these toxic compounds do not build up and is why the balance between phase 1 and 2 is so essential. Genetic quirks and other factors can change the amount of each nutrient required by an individual, or can affect the way the body converts some of the raw materials it is given. For example, food chemicals such as sulphites which are toxic, are metabolised through several steps in phase 2 to produce sulphate which is non-toxic. Some people are unable to efficiently convert sulphites into sulphate due to genetic weaknesses in the sulphation pathway or faulty, overloaded or damaged enzymes in that pathway. To help keep the sulphation pathway moving, these people require higher levels of certain nutrients which support a better level of function. As another example, a person with Gilbert’s Disease may be able to improve this if they increase the nutrients required for their glucaronidation pathway. Different people may have different problems with different pathways. Standard liver function blood tests do not indicate when the liver is stressed or overloaded. It takes physical damage (injury) to occur to the liver before an abnormal liver reading is shown in a blood test. There are a number of other tests available which show where imbalances in liver function may be occurring; in both phase 1 and phase 2. The type of test to use will vary depending on the person’s symptomatology, and consultation with an experienced practitioner is recommended. The entire body including the liver, runs on enzymes and relies on these to carry out house keeping, energy production, and to make substances that keep the body running such as hormones and neurotransmitters. Enzymes enable the cells to live, and must have the right vitamins and minerals available to enable them to work properly. Every enzyme system has preferred minerals it is designed to work with such as zinc, magnesium, calcium, iodine or selenium. If these are not present in the required quantities when needed, the body will try to find a solution and may opt to use metals or minerals that carry a similar electrical charge. However, these may reduce the speed at which the enzyme works or damage it. Minerals often work in pairs or three-somes and many are affected by competition with other minerals or metals. Zinc for example, will be thrown out if there is too much copper. Calcium and boron will be replaced in the bones by lead if lead is high. Mercury will disrupt the use of zinc and selenium. Chlorine and Fluorine can stop iodine from being used correctly. Low potassium in the cells can inhibit the correct absorption of calcium. These are only a few examples of metal/mineral competition; there are many others. Heavy metals and chemicals usually lodge in tissues throughout the body when they are unable to be excreted and can cause significant chronic health problems. This is especially so if they have an affinity for the liver and kidneys because the body relies upon these organs to remove them. The enzymes in the liver for example, are reliant upon minerals such as selenium, zinc, molybdenum, magnesium and iron to keep running and all of these can be disrupted by the presence of metals. See Heavy Metal Testing for more information. Each day the liver manufactures approximately 1 litre of bile, which serves as a carrier for many toxic substances. In the intestines, the toxin load in the bile should be absorbed by fiber and excreted as a bowel motion. A diet low in fiber results in inadequate binding and potentially re-absorption of the toxins. This problem is magnified when unfriendly bacteria in the intestine modify these toxins to more damaging forms. When the excretion of bile is inhibited, toxins stay in the liver longer. This is usually due to obstruction of the bile ducts and impairment of bile flow within the liver. The most common cause of obstruction of the bile ducts is the presence of gallstones. 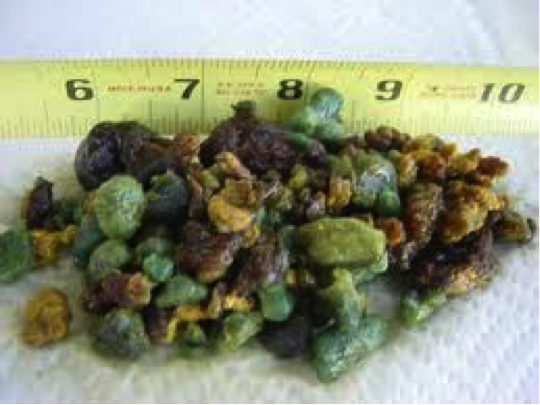 Gall stones may be hard (calcified) which show up on scans, or they may be soft fatty deposits of congealed, sticky bile which do not show on scans. The soft ones are more common and most people who’ve eaten a typical starchy NZ diet will have them. On the right is an example of the kind of rubbish most people have blocking their gall bladders. These stones do not show on scans because they are not calcified but can result in similar symptoms. They can be cleared with a liver/gall bladder program, but this should always been done under practitioner supervision. Approximately 80% of all gallstones show no symptoms and may remain “silent” for years – their presence showing as generalised liver dysfunction. • Eat organically produced foods as much as possible to avoid toxic chemical residues. • Avoid all artificial flavorings and preservatives. • Avoid damaged fats such as the hydrogenated fats and trans-fats found in many processed foods. • Use cold pressed oils and do not use them for cooking. Only a little butter, ghee, duck fat or coconut oil should be used for cooking. Cooking with olive oil is still controversial. If used, do not heat it to a high temperature, or add water to the pan regularly. Try to use water rather than oil in cooking – i.e. poach rather than pan fry. • Make sure your nuts and seeds are really fresh. Ones in shells are the best. • Limit sources of saturated animal fat like sausage, bacon, salami, hot dogs, high fat dairy products like ice cream and cheese. • Alcohol is known to be a powerful toxin that will damage the liver. Even a small amount on a regular basis can create a problem when your liver is already overloaded. It is best to remove it while repairing your liver function. Treating your liver well by following the above advice will have a huge impact on your health and longevity. The major percentage of blood being filtered by the liver is from the portal vein, which carries blood from the intestines. A healthy liver can remove a wide range of microorganisms such as bacteria, fungi, viruses and parasites from the blood, preventing them from building up in the blood and invading deeper parts of the body. Infections and parasites may come from contaminated water supplies and old piping, even those found in large modern cities. This can cause chronic infections and poor health. The safest thing to do is drink water that has been filtered using a high quality filter. Unhealthy microorganisms can also come from foods prepared in conditions of poor hygiene by persons who are carrying bacteria, viruses or parasites on their skin. Foods, especially meats that are not fresh or are preserved such as deli meats, luncheon or ham also contain a higher bacterial load which may overwork the liver if they are eaten regularly. See About Parasites for more information. Many of the toxic chemicals that enter the body are fat-soluble, which means they dissolve only in fatty or oily solutions and not in water. This makes them difficult for the body to excrete. Fat soluble chemicals have a high affinity for fat tissues and cell membranes, which are composed of fatty acids and proteins. In these fatty tissues of the body, toxins may be stored for years before being released during times of exercise, stress or fasting. During the release of these toxins, several symptoms such as headaches, poor memory, stomach pain, nausea, fatigue, dizziness and palpitations can occur. The use of a high quality bentonite clay can remove both heavy metals and chemical toxins from the bowel in a safe and gentle manner. Vegetable foods and many herbs are helpful to the liver. This is because they are a rich source of antioxidants, vitamins and benficial minerals. It is best to eat spray-free produce for obvious reasons. • Beetroot and artichoke: both help with liver drainage. • Protein: fish, sea foods, meats, eggs, poultry, raw dairy, unpasteurized whey, rice or pea protein powders provide essential amino acids without which the liver cannot operate correctly. • Radishes, watercress, broccoli sprouts, garlic, onions, leeks, mustard sprouts, all Brassica vegetables, turnips, eggs, sardines: these are all rich in sulphur which is vital for detoxification. (Large quantities of them however, can pose a problem for people who have difficulties converting sulphur to sulphate). • High fiber foods such as whole grains, psyllium, ground flax seeds, fresh fruit and vegetables: fiber binds toxins and eliminates them through the bowel. Kelp provides many beneficial minerals and alginate which helps to bind toxic metals in the gut. • Apples contain pectin which helps to bind and excrete heavy metals right off the intestines. This directly helps to reduce the load of filtration on the liver. • Beets, carrots, red onions, colourful capsicums and aubergine (eggplant) contain flavonoids and beta-carotene which are potent antioxidants. • Garlic contains allicin and the mineral selenium, both antioxidants. It assists the removal of heavy metals from the liver. • Eggs, brown rice and unprocessed whole grains, broccoli, spinach and other green vegetables/herbs contain B-complex vitamins which improve liver function and promote liver decongestion. • Brassica vegetables such as cauliflower, broccoli, cabbage, Brussels sprouts, Bok Choy, kale, watercress, radishes, and turnips contain glucosinolates (as well as sulphur) which help the liver produce enzymes for detoxification. • Bitter vegetables such as bitter gourd, dandelion greens, mustard greens and chicory promote the production and flow of bile. Bitter teas such as dandelion, burdock and chicory are also good. When working with me, you may be given supplements to take to increase the level of nutrients available to your liver and to help correct breakdowns in the various pathways. Some of these may be required long term due to genetic “quirks” you may have, or common depletions in our food supply. There are also supplements which may make certain conditions worse because of the effect they have on phase 1 or phase 2 and it is wise to work with a practitioner when choosing supplements if you suspect you have a liver-related problem.